On 20 February 1880, Francis, married Sam Archibald Davis, in St Luke's Church in Adelaide, South Australia . William Richard Staker was born on 18 August 1840 in Islington, South Australia , son of Francis Staker and Harriet Page. FATHER ATTACKS HIS SON'S HOUSE. "THREATENED TO CHOP US UP." At the Adelaide Police Court on Mon- day morning, before Mr. J. Godon, S.M., and justices. William Richard Staker was charged, on the information of Samuel Albert Staker, of West Adelaide, with hav- ing, at an early hour on Monday, unlaw- fully and wilfully damaged one window, one door, and two leadlights, to the value of £3, the property of the informant. When the defendant stepped into the dock he was in an excited state, and immediately on hearing the charge he said, '"I am willing to pay for it. It was all his own fault for not letting me in." "Are you "guilty of damaging the property?" asked the officer of the court, and the reply was "Yes." The informant stated that at 2 o'clock that morning the defendant went to his house, and after making a disturbance and threatening to smash in the doors, he got hold of a hoe and broke the glass out of the dining-room door. _ Then the defendant found an axe, and with it smashed two leadlights and the front door. The infor- mant continued, "The defendant also threatened to chop us up and then to 'do' for himself." Mr. Gordon, S.M.-Is he any, relation of yours?-He is my father. The defendant said he had been shut out, and he keenly felt the action after what he had done for his sons. Mr. Gordon-You are fined £2, and will have to pay damage £3, court fees 15/, and witness fees 15/, or £6 10/ in all; in de- fault six weeks' imprisonment. Anna Louise Staker was born on 1 December 1863 in Allens Creek, South Australia , daughter of William Richard Staker and Ruth Haines. She died on Wednesday, 29 June 1864, aged 6 months and 28 days, in Allens Creek, South Australia . Harriet Emma Staker was born on 24 February 1865 in Allens Creek, South Australia , daughter of William Richard Staker and Ruth Haines. She died on Wednesday, 17 January 1866, aged 10 months and 24 days, in Allens Creek, South Australia . 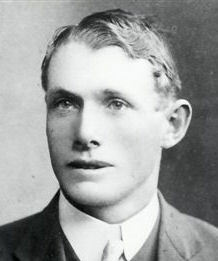 William George Staker was born on 15 May 1866 in Allens Creek, South Australia , son of William Richard Staker and Ruth Haines. On 12 June 1888, William, aged 22, married Caroline Ann Jackson, aged 19, daughter of William Jackson and Caroline Ann Bonham, in Wesleyan Jubilee Church in Kent Town, South Australia . Arthur James Staker was born on 15 September 1867 in Allens Creek, South Australia , son of William Richard Staker and Ruth Haines. Charles Henry Staker was born on 15 March 1869 in Allens Creek, South Australia , son of William Richard Staker and Ruth Haines. Cattle Duffing in the North. William Henry Slee, a young man of about 28 years of age, and the owner of 5000 odd acres of pastoral land in the Wirrabara district, was sentenced to three years' imprisonment by Mr.Justice Gordon at the Gladstone Criminal Court on Friday on several charges of cattle stealing. The case excited widespread in terest, and the Courthouse was crowded with squatters and farmers from the northern districts. Slee is a married man with one child, and had the reputation of being an exceptionally smart stock dealer. He was represented by Mr. Stuart Ronald, of Port Pirie who made a strong appeal to the jury on the two first charges, of which the accused was acquitted. On a third count, however, a verdict of "guilty'"was returned, and Mr. Justice Gordon passed a sentence of three years' imprisonment on the prisoner. Mary Elizabeth Staker was born on 6 November 1871 in Allens Creek, South Australia , daughter of William Richard Staker and Ruth Haines. Fanny Cecelia Alice Staker was born on 2 September 1874 in Allens Creek, South Australia , daughter of William Richard Staker and Ruth Haines.